Everybody has heard the story about how Captain John Smith and his crew tried to catch fish with a frying pan during their exploration of the Chesapeake in the summer of 1608. The fish were probably menhaden (aka alewives, bunkers, pogies). If you’ve ever tried to get close enough to them to throw a cast net, you know what a poor rig a frying pan would be. Smith did catch some fish (possibly croakers, sheepshead, and flounder) at the mouth of the Rappahannock by stabbing them with his sword. You probably also know that he made the mistake of spearing a stingray, which promptly speared him. In great pain, Smith directed his men to dig his grave. But when the pain subsided several hours later, he ate a roasted ray wing for supper. Captain Smith may not have been much of an angler, and his gear was primitive, but he records a rich, healthy Bay that gives us a great standard for today’s restoration programs. Even though the Chesapeake is hurting today from an excess of human pressures, exploring the Bay along the new Captain John Smith Chesapeake National Historic Trail will give you hope that we can succeed in those restoration efforts. Here’s a selection of spots on the trail that will make any angler smile. The lat/lon numbers are approximate, since these are large areas. Do a little scouting, though, and you’ll find their sweet spots. Several respected scholars believe that Captain Smith and his crew met the “gyant-like” Susquehannock chiefs from up the river on Garrett Island during their exploration of the head of the Bay in the summer of 1608. For the local Indian tribes, it was a neutral territory where canoes could find a safe landing place in any weather, with a 100-foot-high peak for a lookout in all directions. Today, the island is part of the Chesapeake Islands National Wildlife Refuge, and it still looks a lot as it must have in Smith’s time—except for supporting the U.S. Route 40 and Amtrak bridges. And as it must have been then, it is ringed today with underwater grasses like wild celery and hydrilla, especially at the downstream end. Garrett Island marks a transition between the Susquehanna and the Chesapeake, and its fish population reflects that fact. Throw a Texas-rigged 5" Senko or Yum Dinger into the pockets, cuts, and edges of the grass and you could find a smallmouth, a largemouth, a rockfish, a big white perch, or even a walleye eating it. While you’re at it, try running a firetiger crankbait through the eddies that form both up-current and down of the bridge pilings. And since you’re already out there, try the same baits on the nearby Susquehanna Flats, especially early and late in the day. There are plenty of places in and around the Bay to make anglers smile. This striped bass beauty was hooked near Breezy Point, Maryland. In June of 1608, Captain John Smith and his crew sailed up the Bay’s western shore, looking for a large river that the Nanticoke Indians had told him about. He skipped the West, Rhode, South, Severn, and Magothy, dismissing them as “some small, shallow creeks” before turning into the first river “large enough to admit a ship.” That turned out to be today’s Patapsco. The English still firmly believed that the Chesapeake was actually the entrance to the fabled Northwest Passage to China and India. Smith and crew explored and mapped the Patapsco up to Elkridge, where the river’s rapids stopped them. As he entered the mouth of the Patapsco, Smith must have had to navigate through a series of oyster reefs that had grown all the way to the surface. Since 1608, sea level has risen about 4 feet, and many of those reefs have been dredged repeatedly. But today reefs remain as Belvedere Shoals, a series of hard-bottom lumps that top out at 12­­-15 ft. with 20-25 ft. of water around them. Fish them with grass shrimp and Gulp! Alive Sandworms to catch white perch and spot. Ice down the largest of these tasty panfish. Put the smaller ones into the livewell and use them to liveline the lumps for rock. Captain Smith and crew put into then-uninhabited Tangier Island in June 1608 to recover from a thundersquall and look for fresh water. Anybody today who knows Tangier knows they didn’t find any springs, but they did get their Discovery Barge back into operating condition for their trip up Tangier Sound. Today, visiting anglers will find a warm welcome, great crab cakes, and plenty of soft drinks on Tangier. In addition, they’ll find good fishing around the island’s various marsh points and drains. One of the most interesting spots on the island is the tide rip that forms on the bar that extends offshore from the Fish Hook, the beach at the south end of the island. Whichever way the current is running, a strong rip will form over the bar. In a shallow-draft skiff, try drifting over the bar, working both the up- and down-current sides with a bucktail jig tipped with a piece of Fishbites EZ Crab or a strip of squid. You might also try walking a Spook or a DOA 5.5" soft jerkbait over the rip. Rockfish, specks, puppy drum, and big croakers feed there. Striped bass, croaker, red drum. At this spot, where the Rappahannock and the Piankatank meet the open Bay, Captain John Smith inadvertently ran the Discovery Barge aground in a grass bed. While he and his crew waited for the tide to rise, they got out of the boat and began spearing fish with their swords, which led to his painful encounter with the ray. Based on Smith’s report that the fish’s poisonous barb was in the “middest” part of its tail, it was probably a southern stingray, not a cownose, whose barb is at the base of its tail. If you catch now-more-common cownose, note that you, too, can fillet the wings and grill them. The best deal here, though, is the restoration oyster reefs in these two rivers. They are built by the Virginia Marine Resources Commission and stocked with oysters grown out by local volunteers and the Chesapeake Bay Foundation’s Oyster Restoration Center in Gloucester. Like the reefs that Smith would have seen here, these oyster reefs are hazards to navigation. Per today’s U.S. Coast Guard regulations, they have a reef day marker on each end. To fish one, watch the tide and the current. If the tide is high, try a Chug Bug, a Mirrolure Top Dog, or a suspending X-Rap over the top. Otherwise, bounce a jig head with a Fin-S Fish, a Bass Assassin, or a BKD down the side for a puppy drum, a speckled trout, a rock, a croaker, or a flounder. On a fly rod, do the same with a 3", 1/0 Clouser in chartreuse and white. At the end of their second voyage up the Bay, in early September 1608, Captain John Smith and his crew decided to explore the Nansemond River, on the south side of the James just inside Hampton Roads. The Nansemond Indians were well aware of the English and their Jamestown colony just upriver. They set up a clever ambush by luring the English upriver for a visit to one of their longhouses, built on a marsh island along the river’s channel. Smith, an experienced warrior himself, foiled the plot and captured several Nansemond canoes. He negotiated a peaceful trade for corn before heading home to Jamestown. The best deal up the Nansemond is big croakers. This river has some of the strongest tidal currents in the Chesapeake, and the fish hang along channel edges during the day, moving up to the marsh edges evening and morning. Work a high-low bottom rig in deeper water and a fishfinder in the shallows, baited with a bloodworm and a strip of squid or a chunk of food shrimp. For an alternative in weaker current, try jigging a 1/2-oz. PJ (pompano jig) tipped with bloodworm, with a 1/0 TurTurn Inshore hook, tied on the line a foot above with a Palomar knot and baited with a strip of squid. Belvedere Shoals at Patapsco River near Baltimore, MD. As with any venture on the water, pay heed to these safety tips. John Page Williams has been fishing and boating the waters of the Chesapeake since he was a young boy growing up on the lower Potomac River. 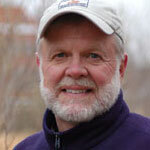 He is senior naturalist for the Chesapeake Bay Foundation and editor-at-large for Chesapeake Bay magazine. He frequently writes on fishing and environmental issues.